The weather has definitely taken quite a cold turn, this morning it was a beautiful -20C, I didn’t even want to leave my house this morning it was that cold. While the snow is beautiful and the holiday season is a special time for families to get together and enjoy each others company, sometimes it can become a bit routine and not so much fun for the youngest members in the house (and to be honest, when its super cold out even adults start to get a bit bored!). Canadian games distributer, Kroeger, has a fantastic line up of unique and fun games that also help your child learn and grow. 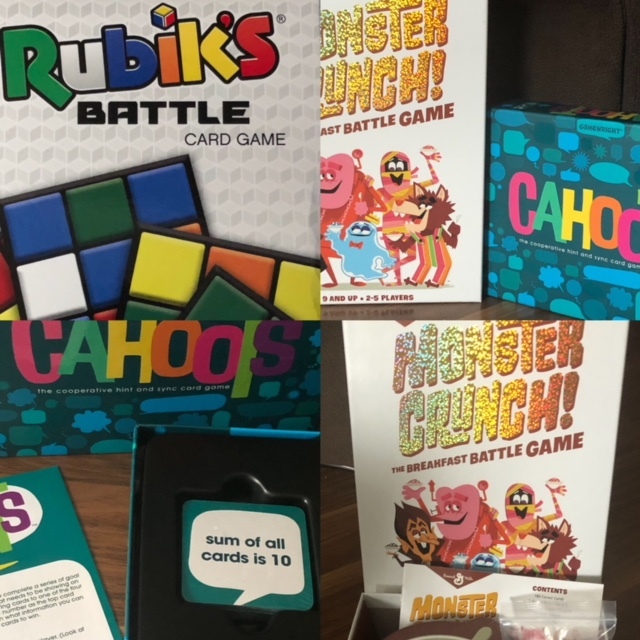 From Rubik’s cards to breakfast cereal to communication – you can find unique games that will suit every member of the household. Not only are the games fun but they improve your communication skills and working together as a family. 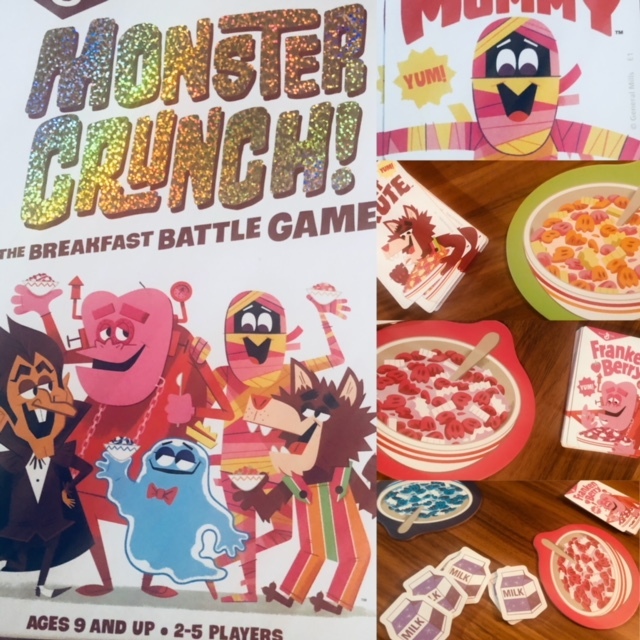 Monster Crunch is the breakfast game that encourages you to play with your food, where the ultimate goal is to see who can eat the most cereal. The perfect game for a home full of boys who love to play with their food and compete all the time on who can eat the most. This game starts with every player choosing their character – Count Chocula, Franken Berry, Boo Berry, Fruit Brute and Fruity Yummy Mummy (are any of these sounding familiar yet?). Each of these monsters have their own special powers that can change the rules of the game. Each character also has matching cereal cards and a cereal bowl place card. The ultimate goal of the game is to eat as much of your cereal as possible and this has to be completed in three hands. To start your first hand, you draw twelve cereal cards without showing anyone your cards along with one milk token. 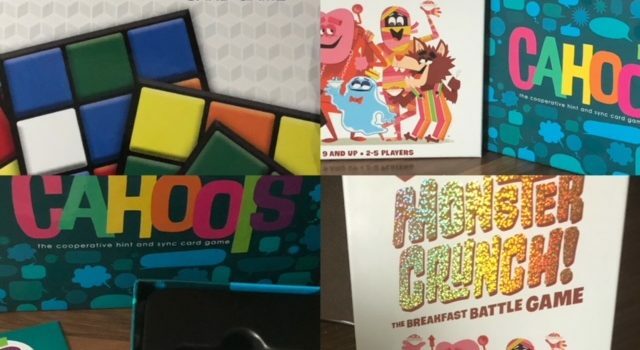 The first player will play a card into their cereal bowl and the next player will now play a card of equal or higher value into their own cereal bowl or pass (each cereal card has a number on them). If you do have to pass, you are out for that round but you do get to take and keep a milk token. What are milk tokens? Milk tokens have their own special powers which allow you to combine cards in order to keep playing (bonus!). The hand ends when any player places their last card into their cereal bowl. Once all three hands have been played, you count the total number of cards in your pile – the player with the most cards wins! This game was easy to follow, a child of six or seven could easily play this game with an older adult or child around to help them if they get stuck. This game was a lot of fun to play together, it was competitive and we were purposefully getting each other out in each hand but we also had a lot of good laughs together (usually at each others expense but it was fun all the same!). 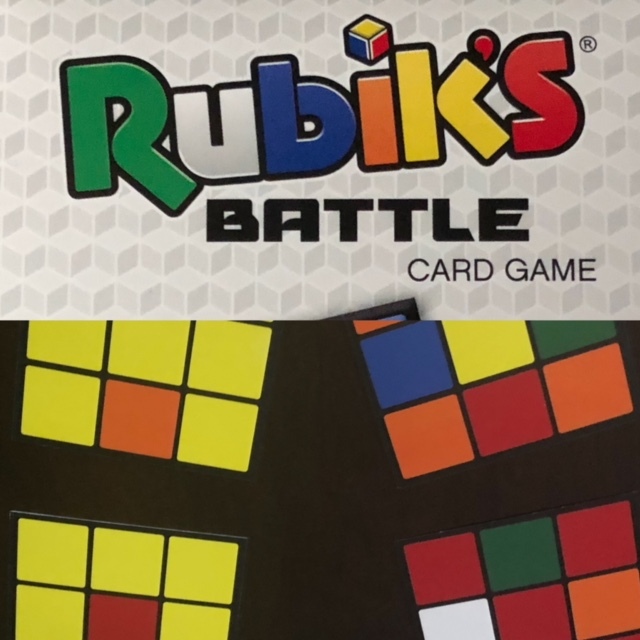 Rubik’s Battle is a fast paced card game using the unique Rubik’s colours and square designs. Our youngest was pretty excited to play this game as he has a fascination with the cube itself, which I am sure we can all admit to having despite how difficult it is to solve. This game at first was a bit hard to follow and I had to re-read the instructions several times to understand it myself and then to be able to explain it to my kids. The game is played by shuffling and dealing all of the cards in the pile out to every player. Players will at the same time flip over the top card and place it in the centre so everyone can see the cards. The first player to call out a colour based on their card criteria wins. The criteria is: a colour on their card that is not on any other card OR a colour on every card that is not on their card. They then collect those cards. The game is finished and won when one player has collected all of the Rubik’s battle cards. This game did seem intimating at first but it is actually quite a bit of fun and really gets you thinking. I definitely suggest reading the instructions several time overs to the players and maybe start by using one of the criteria first until everyone gets comfortable with the rules of the game. Once you are more comfortable, the answers will be flying out of their mouths at lightning speed. This battle of concentration and wit can be purchased at Toys R Us. 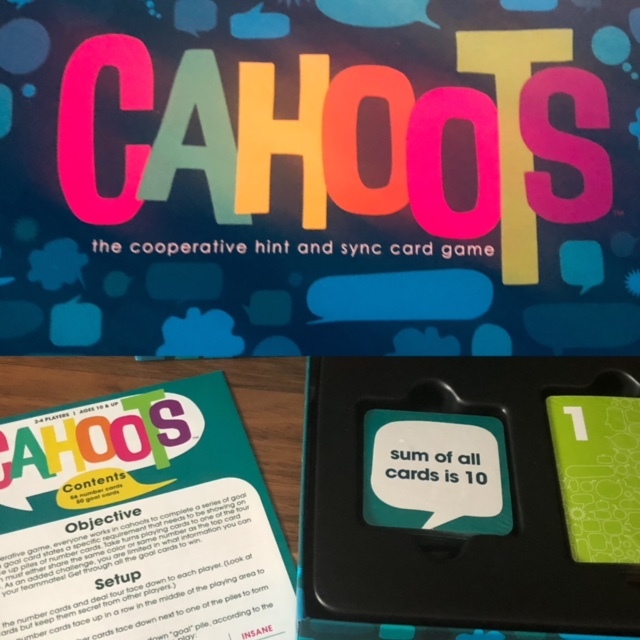 Cahoots is a bold, colourful card game where players have to work together in order to complete a series of goals (all without communicating what cards you have in your hands). Players MUST work together in order to win (which is opposite to what I originally thought this game would be)- making this a great family game. You can play with two to four players and the recommended age is 10 and up. You start the game by first setting up the playing area. Each player receives four number cards left face down. Four number cards are placed face up in a row in the middle of the players card. The remaining cards are placed in a draw pile. The goal cards are shuffled and four are placed face up in a row in the middle. When it is your turn to play, you play one card from your hand onto one of the four number card piles (it must either be the same colour or number as the top of the pile). You are aiming to complete the goal cards (ex) three green piles, all odd numbers, etc…You are not allowed to tell each other what numbers or colours you have but you can use other cues like “I have a better card for that pile” or our favourite – “don’t play that pile!”. I would definitely recommend following the age recommendations on this game (ten years and older) as some of the goals may be harder for younger children. It would be quite difficult to help a younger child out without breaking the rules of the game. That being said, it was an extremely fun game to play and we had to keep stopping ourselves from cheating by giving away the cards in our hands. It is fantastic family bonding game where you are encouraged to communicate and work together to achieve the final goal. What is your favourite family game to play together that encourages communication and team building? I love Kroger for so many reasons. These games would be great for families, and I know my kids would love them. And it’s a great way to help keep kids entertained when it’s too cold to be outside too. One of my goals is to bring the family back together at the table … both for dinners and fun. These games will help make that possible. Some great selections there! We’re all about games and play over 300 different every year. Let us know if you need more recommendations! Yes games are a great way to keep everyone sane inside during the winter months! We’ve been playing a lot of Rummikub lately. It can be a little long, but we love playing together. We love family game nights and are trying to build a good collection of board games! I think my family would love the Cahoots for sure!